If you're looking for a new way to enjoy your favorite music and other radio programming, a portable Internet radio, also referred to as a Wi-Fi radio, is a great option to consider. While you can certainly listen to streaming radio stations and apps like SiriusXM (if you have a subscription) and Pandora using your computer, tablet or cell phone, a portable Internet radio is a separate tabletop device designed just for this purpose. You'll be able to choose among thousands of radio stations from locations around the world, with selections available in any format you might want to listen to. 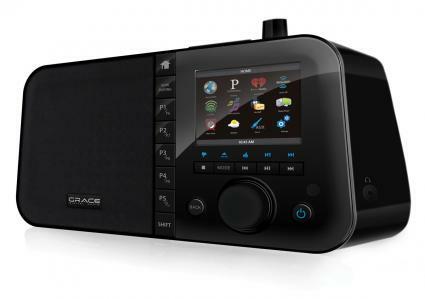 Grace Digital is among the best brands to consider when looking for an Internet radio. The company offers several models of Internet radios, ranging in price from $130 to $230. I had an opportunity to test one of their current portable Internet radio models - the Mondo Wi-Fi Music Player - and was extremely impressed with the unit. Costing around $180, Mondo is at the pricing mid-range for this brand, with the main differences among various models being related to size, shape and general design features. The Mondo from Grace Digital is super-easy to set up and use and has amazing, crystal-clear sound quality. It's simple to navigate through the thousands (more than 50,000) radio stations by broadcast location and genre, and to set up pre-set buttons (up to ten) for your favorites. My experience with this device is completely positive. The only feature I wish it had that it does not is a touch screen, but that does not detract at all from how much I enjoy using it. The device has extra features that I did not expect, such as a built-in alarm clock and ability to show weather forecast information on the screen. I am a fan of Pandora and find that it sounds better through the Mondo than when I play it using my phone, tablet or computer, even using an external speaker. You can stream music from your computer or phone to the device. A review on the Gadgeteer states, "Grace Digital Mondo radio does so much that I can't imagine not having it in my house. It is that useful." A positive review on Audioholics.com points out that the Mondo model has a "faster processor" than previous models from Grace and has "a new color LCD screen to navigate and select your music." The Audioholics review did not have anything nice to say about the device's remote, but I did not have any trouble using it. There really isn't much of a need to use a remote with this type of device anyway. An Amazon reviewer who describes himself as a "radio nut" describes this device as the "best all-around radio I've ever owned." Mondo is not the only one of Grace Digital's portable Internet radios to get high marks from reviewers. Two of Grace Digital's previous models made Good Housekeeping's list of the best portable Internet radios. If you love the idea of a portable Internet radio but are looking for a lower price point, the Sangean WFR-28 Internet Radio a good option. Priced at just under $150 on Walmart.com, it is one of the most affordable options available. It is also smaller than the other two models. The Sangean WFR-28 streams fewer radio stations than the more expensive options, but budget-minded listeners can likely still find something to enjoy from among the more than 17,000 available stations (via Frontier Silicon radio portal service). However, it is important to note that iHeart radio and Pandora are not available on this device. Like the other options, this device also functions as an alarm clock. This unit can use dry-cell or rechargeable batteries. A remote control app is available for iPhone and Android. A Monitoring Times review describes this device as a "winner" that provides "big sound in a small package." Reviewers on Amazon give it high marks, praising its "excellent" sound quality. This is echoed in a review on the Carlyle Tech blog. I like the convenience of being able to enjoy web-based music while keeping my other devices - which I frequently use for work - free to use for other purposes. It's also great to be able to access live streams from thousands of radio stations all over the world through the device. My husband grew up watching New Orleans Saints football on TV, with the sound off and the radio tuned in to WWL-AM 870. With this device, he can easily do that again - and enjoy higher sound quality and less of a delay than if we tried to use the station's website to stream the broadcast. Only you can decide if this type of device is something that you would benefit from owning. Make your decision based on your web-based radio content listening habits and your preferences for using the devices you already own that have the ability to stream music. If you'd rather keep your radio listening separate from your other devices, a portable Internet radio is a great option for you to consider.